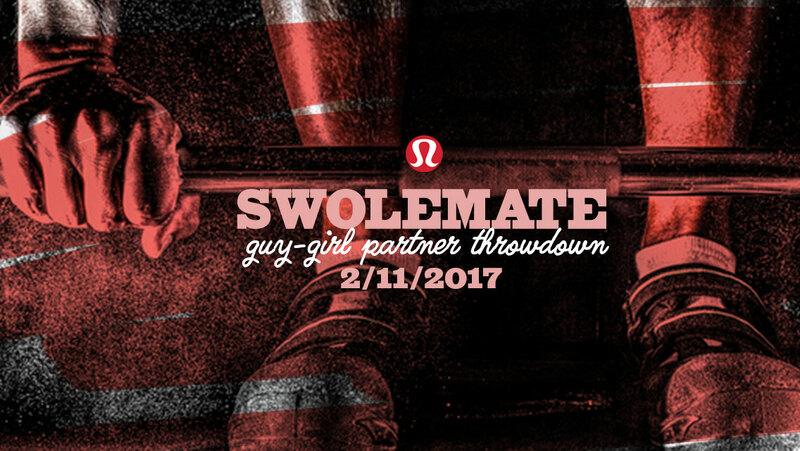 The Second Annual Swolemate Guy-Girl Partner Throwdown is a great way to celebrate the season of love with someone you love! Brought to you by 41South and hosted at CrossFit 1Force, this exciting event will feature balanced tests for Guy-Girl teams in two divisions, both Rxed and Scaled. Get your tickets now, this event sold out fast last year and it will sell out again! We are proud to announce that Lululemon Cherry Hill Athletica will be the title sponsor of the event! They will host a custom heated tent outside for athletes to hang out, warm up, wind down and even SHOP! Prize packages for both RX and Scaled divisions will include a custom in-store fit session for all 12 podium finishers! All male winners will receive a pair of Lululemon shorts of and all females will receive a pair of pants. You will get to go in store and select your favorite pair, and our very favorite Lemons will be there to help you with a fit session! Winners will also receive prize packs full of awesome loot including 1Body at 1Force massage, Steve’s PaleoGoods, KILL CLIFF and much more! For RX workouts, expect to move a barbell for any oly lift at 155/105 for reps, 30/24-inch box jumps, deadlifts 275/185 for reps. Proficiency in double unders, chest to bar pull ups, toes to bar, handstand push ups and muscle ups. For scaled workouts, expect to move a barbell for any oly lift at 115/75 for reps, 24/20-inch box jumps, deadlifts 225/135 for reps. Scaling of any movement will be permitted, but those athletes who scale down below the standard will place after those who complete the workout as written.